“Someone will usually ask me: ‘How did you pick percussion or drums?’ I didn’t, it picked me. It was always been the sound of a drum that caught my ear,” explains Raynor Carroll, Principal Percussionist for the Los Angeles Philharmonic. A 33-year veteran with the orchestra, Mr. Carroll recently announced that’d he’ll be retiring. His final concert will be tomorrow night, going out with a bang (if you’ll forgive the obvious pun) in a special Sunday edition of the LA Phil’s annual visit from composer John Williams. I had the pleasure of meeting him recently after a rehearsal at the Hollywood Bowl. For about an hour, we sat backstage and talked about his memories of more than three decades with the orchestra, the unique challenges and fun of being the Principal Percussionist, his newly appointed successor, Matthew Howard, and much more. He was friendly and gracious, yet candid, clearly loving the opportunity to make music as a profession but ready to start the next chapter of his relatively young life, still shy of his 60th birthday. The first half of the interview is below, and part two will be published tomorrow. CK Dexter Haven: When did you know that you were going to be a musician as a career? Raynor Carroll: Probably elementary school at some point. I was raised in a house that had music in it. My dad sang in the church choir in and my mom played piano. There was always music in the house. Dad played anything from Count Basie to Ravel’s Bolero, so I got a good mixture. I had 4 other siblings and I’m the only professional musician, but we always had an appreciation for music. I started playing in the Boys Club band and throughout junior high school and high school. RC: Probably late 60’s or early 70’s. I don’t remember specifically, but they definitely played at my high school. I remember that very clearly. CKDH: What high school did you go to? I can’t remember exactly which came first, either that concert at the high school or I came to a concert here at the Bowl around that time. I remember the pieces that grabbed me: Holst’s Planets and Stravinsky’s Rite of Spring. Such vital percussion parts and so rhythmic. It made a mark on me. 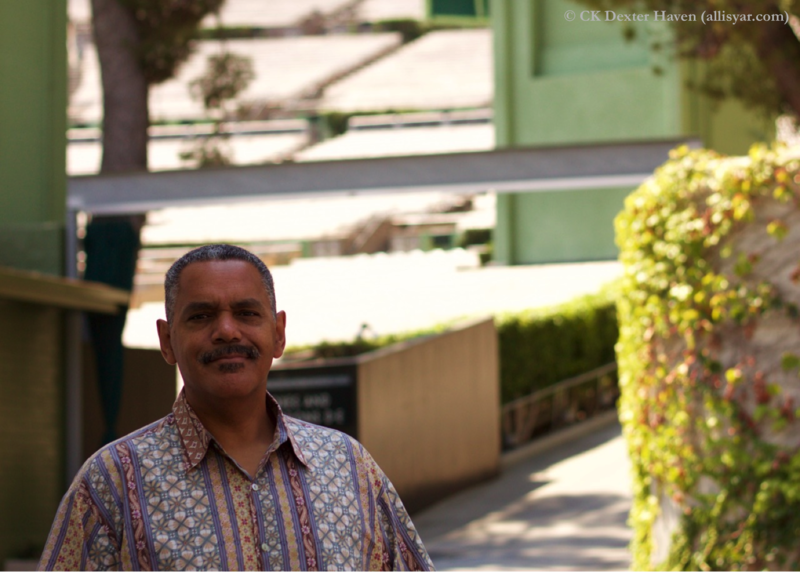 CKDH: When you went to Cal State LA to study, you went specifically with the notion of becoming a classical percussionist and studying with Mitchell Peters, the LA Phil’s Principal Timpanist at the time? CKDH: So story has it that you were still in college when the audition for the LA Phil came up? RC: I had finished at Cal State LA , actually. The numbers are not right in some of the bios, but 1975-79 I was at Cal State LA, then I pretty much freelanced and was doing a little bit of teaching when the audition came up. And I did it. I surprised myself. CKDH: How similar or different was the audition you took compared to the auditions today? RC: I think it’s similar to what we do now. You’d send in your resume and maybe they’d ask for a tape. Then they’d invite you. Now everything is so electronic. Back in those days, I believe I sent in a reel-to-reel [tape], because after that it was cassettes, then CDs and DVDs. Some of the places now want video to make sure you aren’t doctoring up your recording. Other than that, I don’t think it’s too much different. CKDH: So you win the audition, and now you’re in the orchestra playing next to your teacher, the principal timpanist. How different was it being there, playing with him in that setting? RC: What can I say? It was phenomenal, a dream come true. Especially when I became co-principal with him. He couldn’t have been a better person, and he was very relaxed and laid back. He very much guided me through things, recommending, “you should do this and do that.” There is so much involved in my job other than what you see on stage, and it was very helpful to have him there. And the guys in the section then, Walt Goodwin and Charles Delancey, were both easygoing and easy to get along with, so they made the transition for me from training orchestras like the AYS (American Youth Symphony) to the Philharmonic very easy. CKDH: Eventually, both Walt Goodwin and Charles Delancey retired and Perry Dreiman and Jim Babor took over for them in the late 80’s and early 90’s. That’s been quite a run of the three of you being the section. What was it about their playing that led you to choose them at the time, and what has it been like working with them all these years? RC: Trying to find the right pieces to put together to make a section is the goal. First Walt Goodwin retiring in 1985 or so and Perry replacing him, it was an easy fit. Same thing when Jim Babor took over when Chuck retired in 1992 or ’93. That’s why you have a probation period. You hear how they play when they do their audition, and that’s one thing. It’s actually different when you’re on stage playing with the whole orchestra. But the probation period is also to see how you get along with each other. Because you can have a great player, but if you’ve got personal issues, it can be a problem. Part of the process is working with them, touring with them. I think for a lot of people, you see your colleagues at work more than you do your family at home. We spend so much time together. That’s a very important part, and it’s been easy. I’ve been very blessed. CKDH: You allude to the fact that most people only know what they see on stage and that there’s much more going on in the background. Let’s talk more about that. There are the basics of being Principal and the leadership role that you have. How different is it being in that leadership capacity, and what are the parts of the job you like vs. the parts that are a challenge or that didn’t come naturally to you? Is the on-stage or off-stage part of the job more stressful? RC: I like the off-stage work. It’s a challenge. If you know me, you know I’m very organized, and for me, a Principal Percussionist has to be organized because you’ve got so much going on. A month ahead of time, I get music from the library. For example, with the John Williams concert – my last concert – it’s a stack of music, something like 18 pieces. Then I have to mark and assign each part of each piece and assign them to every player. I have to decide if we need extra players or if the guy who’s playing bass drum run can over and play tam tam. So I mark up all that, put them in the folders, and give them to the guys. That’s a very time-consuming thing, but I love doing it because it’s like having this big puzzle and having to put all the pieces together. And when you’re done, it’s a very nice feeling, it’s like, “Ahhhhh.” It’s a challenge but I’ve always enjoyed that. CKDH: So if the flutes get doubling pay for playing piccolo or the trumpets for playing cornet in the same concert, is there any chance percussionists get paid quadrupling or quintupling pay given the variety of instruments you have to play? I’m guessing probably not . . .
RC: Actually, we do get doubling on certain things. Like if we cross over and play timpani, we get a double. Or in West Side Story where I have to fire a starter’s pistol, I get a double for that [chuckles]. Certain things like that. But for all the usual percussion stuff, you’re right, we don’t get doubles for those. CKDH: Given that all of those instruments are part and parcel to the role of being a percussionist, switching between tuned mallet instruments to drums and cymbals, and that a big part of your role as Principal is assigning parts, how do you decide who plays what? It’s seems like there are trends. For example, when Ravel’s Bolero is on the program, I usually see Perry playing snare drum. RC: I play most of the prominent parts, and I know each player’s strengths and weaknesses, so to speak. And I try to balance the workload so that there’s not too much going on for anyone, including me. This summer has been the most intense for me in my 33 years. Start with the two movies we did, complete soundtracks to Harry Potter and Star Trek: both of those movies were written in two-minute segments, then you stop and reset and play the next segment; we played it continuously with the intermission, and it’s a challenge to have all those instruments on stage and to be able to go from one cue to the next in one or two minutes. It was a big challenge and again, I like that. I like trying to figure it out and make it work so that it’s the least obstructed on stage. We’re supposed to appear very calm and we’ve got it down. Hopefully [laughing]. Hopefully no mallets fall or no one’s tripping on a cord or anything like that. CKDH: Any horror stories or amusing anecdotes to that effect? RC: Oh, things have happened, though nothing directly to us. My favorite story here [at the Bowl] is coming out at intermission to set for the second half and there’s this dribble coming down from the top. I look up and there’s a raccoon peeing [we laugh]. There’s another one where we’re playing a quiet passage and there’s a rumbling in the audience, and it’s almost like a wave that’s moving through it. Turns out there was a skunk running through the boxes. CKDH: [Laughs] You talk about the organization that’s required of you. Once, a musician took me backstage at Walt Disney Concert Hall and showed me the percussion room, saying, “This is the most organized room you’ll find backstage here.” That’s probably true of any orchestra with its usual instruments, but especially with this orchestra and its repertoire, there’s a lot more. Between all the exotic Asian, African, and South American instruments that you wouldn’t typically find in Strauss or Beethoven, to the coffee cups and wine bottles called for in contemporary music. I assume you’re the one that has to figure out which coffee cup is “the right” coffee cup for a particular piece. RC: Right! [Laughing] Or I ask someone in administration if they’ll bring me a selection of coffee cups and sometimes they just bring a few and you can’t quite find the right sound, so I always ask them please to bring a bunch. You know, the job has changed so much from when I joined the orchestra. In the 80’s, you saw very few ethnic instruments. Basically you just had congas and bongos – think West Side Story. Now you get that all the time: taiko, the African djembe, for example. I recorded two or three pieces with the orchestra that called for djembe, like I said, years ago was not the norm but now it is. We have three octaves of gongs now, which again, 20 years ago, you didn’t need gongs. To me, it’s a reflection of the world today and what’s going on: more of a melting pot, a mixture of different sounds. Composers are forced to come up with different sounds because they want to be inventive. I remember this one composer had me stretch some masking tape across a drum and the performance was ripping the tape off. Now who would have thought of that? I wouldn’t have. CKDH: Maybe a Foley artist in a movie studio somewhere? RC: Yeah, exactly. I enjoy that part, it’s part of the challenge of getting the part done. CKDH: I remember seeing behind the scenes footage from one of the orchestra’s tours, and it showed you guys in some foreign country getting the chance to go shopping – or maybe you made a point of going shopping – for new instruments. RC: Well you have to! [laughs] When you’re in Asia, you go look for gongs and tam tams and things like that which are harder to find here. We were in Spain, and I remember getting some castanets. For a percussionist, this is obvious, you just do this. CKDH: Among the more conventional instruments, you seem to be a Sabian house when it comes to cymbals. Has that evolved over time or is it just something you decided? RC: It’s been a long time since we made the connection. I believe they came to us and said, “We’d like to endorse you and be your sponsor.” We tried some of their cymbals and we liked them, so we stayed with them all of these years. CKDH: You talk about the composer giving you directions on the sound they want to hear, which makes sense. How often do you find conductors giving you specific direction with regards to actual equipment to use instead of just telling you to play softer or louder, and how do you react? RC: Not often. It’s usually, “Can you use a softer stick,” or like you said, louder or softer. The instances would obviously be more so contemporary pieces we play, and most particularly in the New Music Group. But they pretty much go with what we’ve got. It’s definitely more prevalent when the composer is there. They’ll often make comments and say, “That’s not exactly what I head in mind.” I’ll try to jump that by asking ahead of time. We did the Andriessen opera at the end this past Walt Disney Concert Hall season, and the part said, “African marimba,” which is kind of vague, so I sent him an email about a bunch of things and that was one of them. He replied something like, “Oh, you’re being so specific. You can just lay a woman’s necklace across the marimba and that will be fine.” He wanted that buzz sound from a marimba, and I would never have thought of that. I was actually looking to see if I can find an African marimba that could play the specific notes he called for. RC: Oh yeah. I love playing the bass drum part on The Rite of Spring. As I said, that’s one of the pieces that got my attention at a very young age. But also, that’s the joy and fun of playing percussion, having this wide variety of instruments compared to a trumpet player or a violin player. We have a variety and move around. That’s a lot of fun. CKDH: In the LA Phil, Joe Pereira is the only official timpanist. 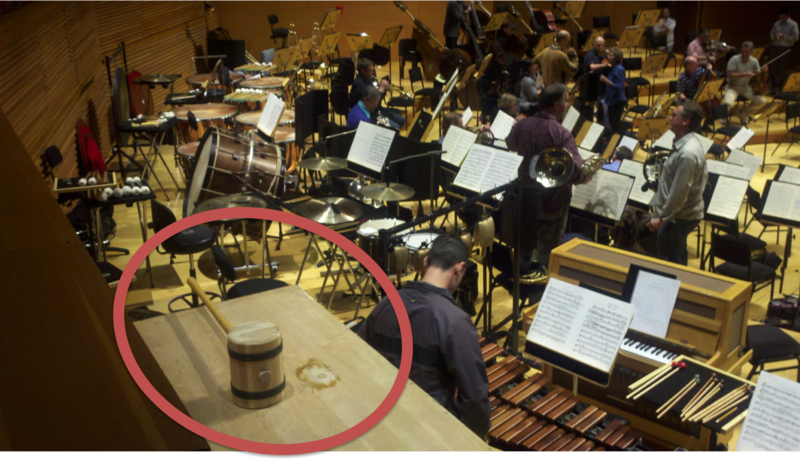 In some orchestras, one of the section percussionists also is also officially Assistant Principal Timpani, which isn’t the case here, so there seems to be more of a distinction between the roles. I know that before Joe was hired, you were timpanist for a year or so. Did you ever consider specializing in timpani instead of being in the percussion section? RC: To me, ideally, it’s both timpani and percussion because I love both. That’s why I feel like I’ve been so fortunate here to be able to do both. It’s great. Even if you’re in the percussion section, there’ll be times when you have to play timpani, maybe in Berlioz and there’s four of us. So it’s both. CKDH: While we’re talking about instruments, I want to bring up some specific ones because you have some great ones in the Los Angeles Philharmonic. First of all, you can’t talk about orchestral percussion without talking about Mahler 6. Tell me about the big box and big mallet. I’ve heard different stories, but I’d love to hear yours. RC: Well, that’s one that we would go through with the conductors. I remember when I first did it in the orchestra in the early 80’s – I believe with Simon Rattle, who is, of course, a percussionist. I forget what we first used, but he said, “Eh, it’s not loud enough.” So we ended up with what kind of looks like a jackhammer: a 4×4 with a pole through it so you could grab it. We slammed it on a podium or something. Not the [conductor’s] podium itself, mind you, but something on the floor. And he loved it. If you go to the percussion room, we still have it and he signed it, something like, “Best hammer ever, Simon Rattle.” This was before he was Sir Simon Rattle. What do we use now? When we moved to Disney Hall, it just wasn’t enough sound. Now we have a hammer – you know the kind that you use when you’re at the circus and you slam to ring a bell – that type of hammer that we made. We hit it with a box that we call “The Dog House” because it’s about the size of a dog house, and there’s a hole we cut out of it for the sound to go out. Your dog could fit in there. And because it’s so big – and Perry usually plays this – you have to have stairs to go up. So it’s a big moment. Every time we play it when that moment comes, I look up in the audience and see that there are people [whispering and pointing], “Oh, watch this.” You can hear them say, “What’s he gonna do? !” It’s great. CKDH: You designed The Dog House? When we did the 6th in Venezuela, it was too big, so the crew took it apart for the trip, then nailed it or screwed it back together when we got there. Things you wouldn’t normally worry about. CKDH: Next instrument I want to ask about: the big cast bells you use for Symphonie fantastique. I love those. I remember the first time you guys used them in Disney Hall, and you could literally feel the sound in your chest when you hit them. RC: We’d been wanting to get those forever, certainly before I was in the orchestra, but they’re expensive. In their place we’ve used many different things, from chimes to bell plates. They never were the right sound, though. Finally, soon after we moved to Disney Hall, a donor donated the money to purchase the bells and we finally had the right instrument. It makes a big difference. I would go to administration prior to that and say [grinning], “Chicago has the real bells. New York has them. How come we don’t have them?” So that’s how we got them. CKDH: I heard that originally they didn’t leave Disney Hall because of the weight? RC: They still don’t. Yeah. CKDH: Is that something that you guys expected when you got them? RC: Well, I would say it’s an administrative decision. I’ve you ask me, the bells got here, so they could move to the Bowl or other places. A few years ago, we did a short West Coast tour with Gustavo [Dudamel] and we did Symphonie fantastique. Knowing that we wouldn’t be moving the bells, he asked us to do it on synthesizer. In other words, we sampled our bells and we played it electronically on a keyboard. It’s not the same sound exactly, but that’s what he wanted. CKDH: This isn’t so much a question about an instrument but rather a piece and a collection of instruments: I remember sitting in the Dorothy Chandler Pavilion when Esa-Pekka Salonen conducted the Revueltas piece, La Noche de los Mayas. CKDH: Before you played it, people were sitting around asking each other, “Do you know this piece?” “No, I’ve never heard of it at all.” And then after it ended, the room erupting with cheers and loud applause. There are a lot of pieces with iconic percussion parts, but that one struck me more than any other. There were like six or so percussionists on stage that night? RC: Six? You want to double that? More like twelve! In fact, thirteen if you count the conch shell. CKDH: Yikes! I didn’t realize it was that many. Had you played it before that performance? RC: Nope. I had heard of it, but never actually played it. It was cool. Still one of my favorites. A fun piece to play and a great piece of music, fun for the audience too. That’s one of the fun things at Disney Hall vs. the Dorothy Chandler: having the audience right behind you. It’s great. They’ll often ask me, “Excuse me, what is that?” Or “What kind of sound does that make.” They ask questions of this, that, or the other, and having them right there is quite cool. CKDH: Tell me more about the transition from the Dorothy Chandler to Walt Disney Concert Hall. I’ve heard stories from retired brass players with only short parts to play in a big piece about having magazines on their stands or other silly stuff like that. In those days, you were literally as far away from the audience as any orchestral player could be. Now, not so much. It’s a lot of fun to have a nice work environment and to actually have a dedicated percussion room. Before that we had nothing. All of our instruments were stored in trunks, and backstage at Dorothy Chandler, you had all these trunks laid out and we had to put our instruments in there after every service and performance. It was kind of a drag. If we wanted to practice, we’d try to reserve a room way up on the 4th floor. More often than not, it wouldn’t be available. Now, it’s so much more professional and convenient to have a percussion room to keep all our things and be able to practice. Tags: Berlioz, Hollywood Bowl, James Babor, Mahler, Mitchell Peters, percussion, Perry Dreiman, Raynor Carroll, Sabian cymbals, timpani. Bookmark the permalink.